Divine Pro is a child theme for the Genesis framework and although the demo has a food based design, this theme would actually work very well for a wide range of different topics. The design of Divine Pro is very nice. There is nothing that stands out as being particularly stunning or unique, but that is not necessarily a bad thing. The blog is quite conventional which means it will be easy for visitors to use. Divine Pro’s biggest bonus is that it is based on the Genesis Framework and when you buy Divine Pro you will get the Genesis Framework too. If you are already familiar with the Genesis Framework then you will be pleased to hear this and it will be a massive bonus for the Divine Pro theme. If not, then all you need to know is that Genesis is an awesome framework that enhances a theme based on the framework. For example, you’ll get better security, rock solid code, automatic updates and a whole library of other themes at your disposal that you can activate quickly. 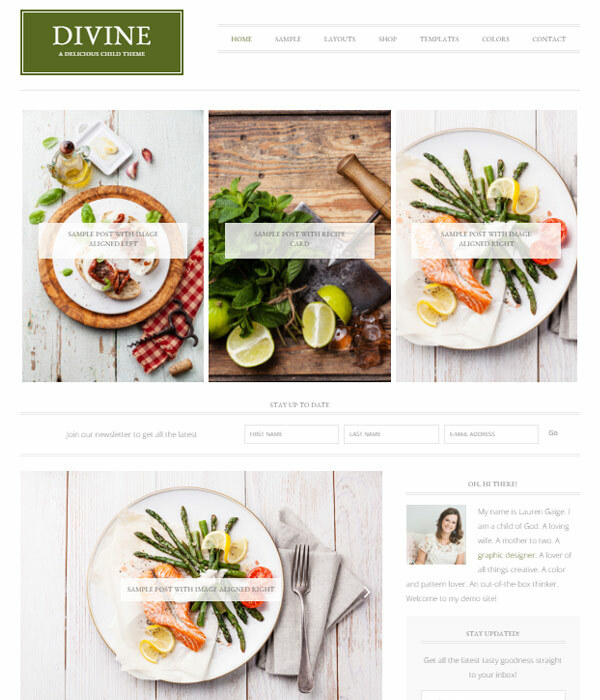 If you are a fan of the Genesis Framework or you are interested in making the switch and you are looking for a blog theme that works perfectly for the food and recipes niche then Divine Pro may be the perfect theme for you.